Since the dawn of comic books publishers have tried to firmly grasp a continuity in which all of their working titles could be aligned. It made it easier for readers to follow along and an established canon helped to build a vast and living world of characters, places and events. However, some writers wanted the liberty to go off-book and create stories that existed outside of the established universe usually taking place in different dimensions within the narrative. So we’d get stories of our favorite heroes existing in a world where the Nazi’s had won WWII, or perhaps the greatest superhero would turn evil and kill his friends. It makes for a different perspective, fun speculation and more original stories. Marvel comics labeled these stories as “What If…? Comics” and DC coined the title of “Elseworlds”. Many stories have been written outside of the norm; so here are ten interesting and entertaining alternate dimension comics to read up on. The first “What if…?” comic published by Marvel was released in 1977. The original first issue of Spider-Man saw Peter Parker down on his luck and looking for a paycheck. He goes to the Fantastic Four hoping to earn some money but they turn him down. However, in this “What if…?” comic we see Uatu the Watcher explain to the reader that there is an infinite number of universes, which sometimes differ because of just one decision. So instead of turning poor Peter down, they let him join the group creating the Fantastic Five. Instead of the public hating Spider-Man, they applaud him for joining the Fantastic Four. However, Sue Storm (a.k.a. Invisible Woman) is often left behind to monitor and survey. Feeling unappreciated and seduced by Namor the Sub-Mariner (who is under the control of Puppet Master), she leaves Reed Richards and becomes a concubine to Namor. Despite the efforts of the Fantastic Four who manage to break the Puppet Master’s spell over Namor, Sue still decides to live with Namor rather than go neglected by the rest, which leaves Spider-Man regretting his decision to join. It’s sad, but it set the stage for later “What If…?” comics in the Marvel Universe. Considered to be the first of DC’s line of Elseworld comics and also featuring the legendary talents of Mike Mignola, is Gotham By Gaslight. Here we see Gotham City set in the year 1889 where Bruce Wayne has returned after finishing a tour of Europe training under the worlds greatest mentors. In Gotham, Jack the Ripper has shown up to murder the criminals and prostitutes of the city. Inspector Gordon works with a steampunk Batman in order to stop Jack the Ripper whose past seems to coincide with Batman’s more than he’d like. This story inspired an animated movie, and spun off into another story called Master of the Future where Batman comes out of retirement to don the suit and fight yet another villain wanting to ruin Gotham. This comic pioneered Elseworld comics and set the precedent for DC’s alternate take on other heroes. In a world where the X-Men send Wade Wilson to be cured of his insanity, Deadpool becomes brain-washed by Psycho Man and begins to kill literally everyone. The premise of the story is pretty much that Deadpool kills every hero in the Marvel universe one by one in unique and creative ways by exploiting everyone’s weakness. Off the back of this story, Deadpool would go on to face the characters of classic literature (Tom Sawyer, Ebeneezer Scrooge, Sherlock Holmes, etc), and even himself. Deadpool does this all because he believes himself to be the liberator of these character’s fictional lives, since it is him alone who thinks he is a character in a comic book (due to a curse from Loki). It’s bloody, terrifying, yet entertaining to see a world where Deadpool takes all the safeties off and shows everyone just how powerful, and insane, he actually is. Set in the wild west, Justice Riders tells the story of Rail Baron Maxwell Lord razing the town of Paradise to the ground. Paradise was the home of Sheriff Diana Prince who seeks vengeance for her hometown by rallying together a posse consisting of Kid Flash, Hawkman, Blue Beetle, Booster Gold, and Martian Manhunter to take Maxwell Lord down. Together they called themselves the Justice Riders and they rode off to stop the Baron from causing further mayhem. Power levels are low, and gunfights are high, all ending with a climactic battle against Lord’s train mech. The art is superb and it really feels like reading an old western. Written by prolific author, Mark Millar, and set in an alternate universe where all of Marvel’s villains banded together to kill or quell every hero in the world. Logan renounced his title of Wolverine and settled down with a family vowing never to “pop” his claws again. However, when money is low and his family is threatened he joins a blind Hawkeye on a risky road-trip across the country in order to gain money to pay the taxes imposed upon him. We get a good look at a fallen world where villains reign, major cities have toppled, heroes has become former shells of themselves and have become corrupt; fighting for greed and vanity. Only Logan will make the difference in the struggle between the villains. Though it’s a harrowing tale, it is an epic story of an old dog that still has some fight left in him. The Kingdom Come miniseries is a masterpiece of storytelling and art. Mark Waid and Alex Ross bring the compelling story of a world where traditional superheros like Superman and Wonder Woman fall out of favor in the public eye for heroes who are not afraid to kill. Wonder Woman urges Superman to reform the Justice League in order to stop this. A conflict emerges between the heroes as to whether they should kill all those who oppose or reform the delinquent heroes. With more complexities coming from Lex Luthor and the public as a whole, it all ramps up to some catastrophic and amazing battle sequences. It’s a futuristic tale of a much older version of our beloved superheroes fighting one last struggle paralleling the book of Revelation and the End of the World. One of the few Marvel “What If…?” comics to garner a follow up series was Tom Defalco and Ron Frenz’ story of May Parker, daughter of Peter and Mary Jane Parker. At a young age she went missing and was found living with Mary Jane’s sister, Allison Mongraine; a con artists who kidnapped May at the request of the Green Goblin. Peter lost his leg as a result of the conflict following their reunion and retired from crime-fighting. Peter and Mary Jane had hoped to conceal their past from their daughter. However, at the age of 15 May began to develop the powers of her father. When Norman Osborn’s grandson began to wreak havoc, May donned the Scarlet Spider costume of Ben Reilly and began to fight crime like her father before her. This “What If…?” comic spawned what was known as the MC2 universe and was later integrated in the Spider-Verse cross-over event. Mike Mignola is the guy you want when it comes to mixing two things together that should have existed all this time. Batman is on a mission to stop the necromancer Ra’s Al Ghul from summoning the demons and monstrosities of the horrific Elder Gods from the writings of H.P. Lovecraft. The story flows naturally from the already dark tone of Batman comics into the madness of Cthulu with complete re-imaginings of characters such as Killer Croc and Two-Face. Sadly, DC has not printed these issues in a solid trade paperback making this legendary crossover a hard one to find all the issues for. Regardless, it’s a fun premise bridging the gap between two facets of nerdiness. Planet Hulk but Caiera Lives! Planet Hulk saw the Incredible Hulk jettisoned off to a distant planet by Reed Richards and fellow geniuses for his own safety and the Earth’s. Hulk pre-maturely lands his space craft on the savage planet of Sakaar where he is forced for fight for sport, gladiator style. He later gets married to a native named Caiera and liberates the denizens of the planet. It ends with Caiera dying and Hulk returning to wreak havoc on Earth. But what if instead of Caiera dying, she was saved by Hulk who sacrificed himself so she might live. Greg Pak returns to to tell the tale of the vengeful wife of the Hulk gathering the forces of Sakaar and attacking the people of Earth. She bends the will of Blackbolt to do her bidding and straightaway kills some Dr. Strange and other fellow Avengers. Along with this issue, a couple other “What If…” comics were released where Hulk lands on the planet originally intended for him, and one where he lands on Sakaar, thinks it’s peaceful and reverts back to Bruce Banner and is killed immediately by the forces of Sakaar. These issues were short one-off comics but still fun to see the differing outcomes of Hulk’s darkest moments. 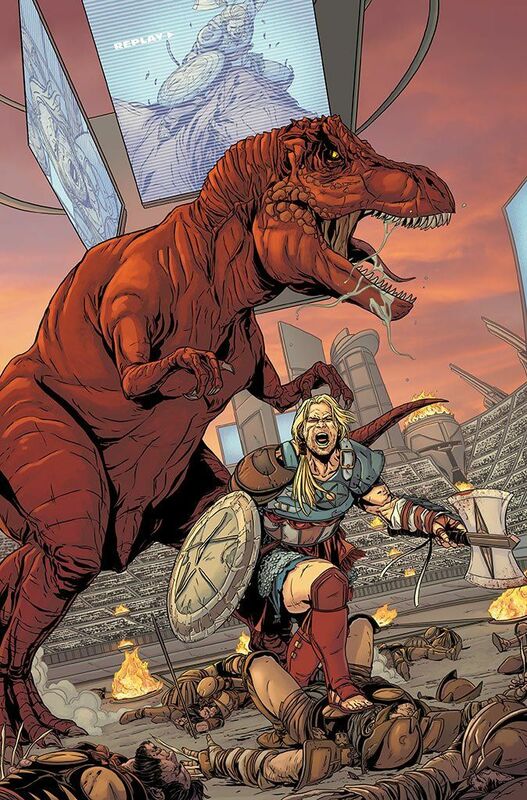 Also worthy of a quick mention, is a five-part run focused on Steve Rogers fighting in the gladiator pits, with his pet T. Rex. Mark Millar does it again with a spin on the classic story of Kal-el. When the planet Krypton was doomed to destruction, Jor-El sent his only son Kal-El to the planet Earth where he might have a chance to survive and do good for the planet. Instead of Kal-El’s rocket landing on the Kent’s farm in Kansas, he landed in Ukraine. Young Kal-El would grow to become the right hand man of Joseph Stalin and a strong advocate for communism. Appearances of Russian Batman, Soviet Wonder Woman, American President Lex Luthor, and Air Force/Green Lantern Officer Hal Jordan highlight the pages of this comic as we get a look into the benevolent leadership of Superman in a world where his ideals are not the American ones that he embodies in the normal continuity. Red Son is widely regarded as one of the most iconic Elseworld stories that DC has to offer. What are some interesting alternate dimensions you would like to see? Let us know in the comments below.